​TRAIL WORK IS AT THE HEART OF OUR LOVE FOR TRAILS. To that end, we're working both in and through Endless Trails to coordinate and lead trail work parties all over the Northwest in celebration of and preservation for beloved outdoor spaces. Our trail work parties are intimate and enthusiastic affairs, and there's a good chance we'll be working on some of the trails you likely love to run/hike/bike each and every spring/summer/fall/winter—and some more remote, harder-to-reach trails you may never have even heard of! After Endless Trails board members logged more than FOUR HUNDRED hours of trail work in the first six months of 2017, they did even more the rest of the year: By year's end, our board had put in more than A THOUSAND hours of trail work and community service in 2017! (And that trend continued in 2018!) You can see a full list of past trail work dates and locations right here. We list all of our annual trail work dates and details on this page as they're confirmed, and you can sign up for any and all upcoming trail work parties we're hosting (and/or to be kept in the loop for upcoming trail work dates) via the contact form below. Easy-peasy! ​AND OTHER PROJECTS TO BE ANNOUNCED AS THEY'RE SCHEDULED! Matt and Kerri (two of your fearless trail work leaders) are both Wilderness First Responders via NOLS/Wilderness Medicine Institute, as well as Wilderness First Aid Certified via Remote Medical International, and we both have extensive experience leading groups both on and off the trails, including extensive Outdoor Education experience. For these trail work parties, we'll be working in tandem with local permitting and trail and park-management agencies (State Parks, the United States Forest Service, Department of Fish & Wildlife, etc.) to make improvements to current trail systems (including trail, trail-head, and park clean-up), update on-site camp and other trail structures, where necessary, and in some cases build new and more sustainable trails. With rare exception, we'll provide any and all trail tools (and work gloves, if you don't already have a favorite pair) needed for trail work parties. ​If you're signing up for one of our trail work parties, we promise they'll be awesome, merrily exhausting and equally rewarding, and you can plan to be outside and on your feet in all sorts of elements. You'll likely be helping brush/clear trail, facilitating adequate drainage, working on existing trail structures, repairing/reshaping trails, or maybe even build new trail. Time commitments vary—the longest (weekend) commitments are typically 6 or so hours on Saturday, and 2-4 hours on Sunday. If it's a one-day trail work gig, we'll still shoot for up to 6 hours, or more if volunteers are willing/able, and we have enough daylight, though many projects fall within a 4-hour time-frame. If you're looking for a specific type of trail work + specific time-frame, just shoot us an email and we'll do our best to accommodate you/your group, or help you find an alternate trail work party. Sign up for a trail work party below, or, if you don't have the time or the ability to make it out to one of our trail work parties, please hop over here to read about specific giving and sponsorship opportunities, and to learn more about how else you might be able to donate time, and/or various other resources. 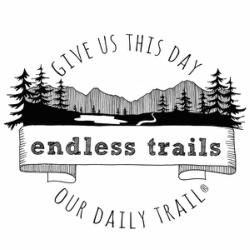 To make a tax-deductible donation to Endless Trails, please click here. Whether or not you decide to partner with Endless Trails, we hope you'll travel along with us here as we traipse some of our favorite trails, explore myriad new ones, work to advocate for hard-to-reach and less mainstream trail systems, and educate outdoor enthusiasts everywhere about trail sustainability, and how to best preserve today's wild places for future generations of explorers. HAVE A FAVORITE TRAIL IN NEED OF SOME LOVE? If there's an area where we aren't doing trail work, but that needs the help? Please let us know. We want to help you rally the troops to protect, preserve, and support your favorite local and regional trails. Hope to see you on the trails soon and very soon! SIGN UP FOR ONE OF OUR TRAIL WORK PARTIES HERE! Select any and all Endless Trails/Rainshadow trail work parties you'd like to sign up for. We'll send out more information & confirmations as we get closer to each trail work weekend. Let us know if it's just you coming, or you + 1, or you + your entire family, so we can better plan our trail work parties. Some of these trail work dates have limited space, so we'll keep a wait-list once we fill up the initial group. Thanks!